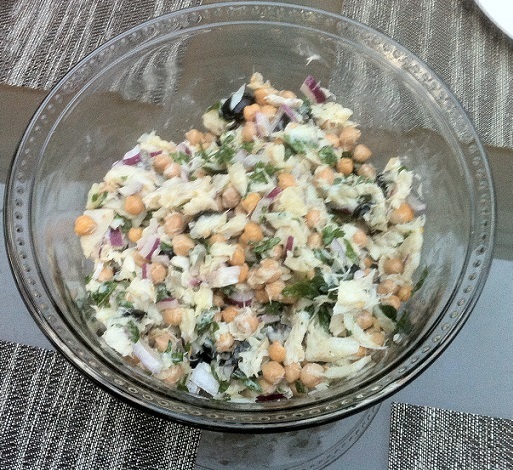 Bacalhau Chickpea Salad, or Salada de Bacalhau com Grão, is a delicious Mediterranean style salad recipe. It is a really light and healthy dish that brings out the flavor of the bacalhau perfectly with the combination of chickpeas, parsley, and olives. This is one of my favorite bacalhau recipes, and it very simple and easy to make without much fuss. 1) Wash and soak the cod in a bowl of water. Change the water 3 times over the course of 8-10 hours. 2) In a saucepan, add the cod and water. Bring the water to a boil after 1-2 minutes and shut off the heat. Remove the water and tear the bacalhau into small pieces. 3) In a large bowl add the pieces of bacalhau along with the rest of the ingredients. 4) Toss the ingredients together well and serve.